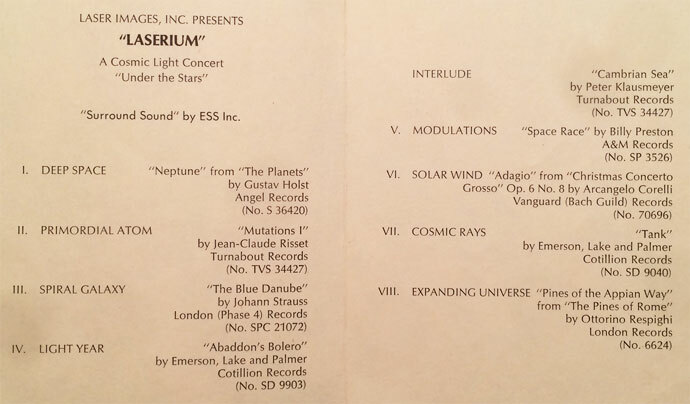 This is an original program schedule for the intial Laserium show, which had its first presentation on November 19, 1973 at the Griffith Observatory in Los Angeles. The program front cover features the dome of the Samuel Oschin Planetarium at the Observatory, located in Griffith Park, where the show was presented (see above). The rear cover features a message from Ivan Dryer, creator of Laserium. The inside features the program selections (see below). Bi fold heavy matte finish paper pamphlet, 5" x 7" (closed), 10" x 7" (open). Near Fine, as New, with exception of a tiny chip in the upper front cover corner, minor wear on the lower end of the spine, and a ball-point pen notation on the rear cover.